Minutes from the Torbay Voice Meeting 20th July 2016, 1pm – 3pm, Tor Hill House, Torquay. Item 1: Introductions and Apologies. This asks carers about needs relating to housing and any housing issues they currently have, on behalf of themselves or the person they care for. The group looked at a draft version of the questionnaire to see how it could be improved, if anything was missing and if it was understandable. Suggestions were added in and it has now gone to have a statement added about how the information will be used. Carol talked about this. The beach clean took place at Hollicombe Beach in Paignton on 14 June. Torbay Voice members and Leonard Stocks Centre residents came along. It was Carol’s 2nd day in the job. Gloves and litter pickers were provided and there was a talk beforehand on the effects of litter on the beach and the environment. People were very saddened by this and glad to be able to help. Lots of litter was collected on the beach and the grass area- 6 bags. Funny things were found like a carpet! It was enjoyable and a good team building event. Carol got to know people. Everyone was really happy to be giving something back to the community and want to do it again. The event was an idea by Torbay Voice members and organised by contacting Tor 2 and Surfers Against Sewage. Every Local Authority has a Healthwatch. Healthwatch Torbay is the local consumer champion influencing, responding, improving and monitoring health and social care services in Torbay. It provides local people, community and voluntary groups with a voice to influence the planning, purchasing and provision of these services. Healthwatch has the power to go into services- to enter and view organizations such as a care home and ask questions about the service. It gains feedback from the public and reviews services. Torbay Voice is working alongside Healthwatch to take part in entering and viewing services. It involves going into a service to see what is happening and talking to people who use the service. There has been training. Alan is interested in getting involved in this. Carol will run some training for him and others who have not yet had training and would like to get involved. This is an ongoing project so people can get involved at a time when they would like to. Torbay Voice and Healthwatch have gone to A&E at Torbay hospital to ask people about their experience of triage. Triage is where a nurse assesses you on arrival at A&E to decide where you should go and your priority in being seen. This nurse is sat near the public area so it is not confidential. The hospital would like to rearrange the area to make triage more confidential. Torbay Voice and Healthwatch did a questionnaire with people after they were assessed by the triage nurse and before they were seen- they spoke to about 20 people. The questions asked if people felt happy for the triage nurse to be close to the seats and the public area. It was also about educating people on where to go- there is a website: http://www.torbayandsouthdevon.nhs.uk and then search for MIU waiting times which display live waiting times at local minor injuries units. This can be also used on smart phones. When asking people the questions you need to be able to give them something in return such as helpful information. They gave an information pack to the people they spoke to. Dave talked about this. He is a Supervisor and works with offenders carrying out Community Payback. They have just been taken over by Working Links- a good and productive takeover. Offenders can receive a community sentence which can mean 40-300 hours of unpaid work to benefit the community- known as Community Payback. This can be completed over a 12 month period. This is up to 7 hours a week if employed and up to 4 days a week if unemployed. It can be completed in groups which are supervised or in individual placements which are supervised by the organisation they are working for- i.e. a charity shop. Offenders are risk assessed before placed in individual placements- they are low risk. If offenders don’t turn up without good reason they get a warning- after 2 warnings they are in breach and go back to court. They often end up with more hours. They work with many voluntary and community organizations such as RSPCA, YMCA, Age UK, Growing for Life, Shekinah. Shekinah take individual placements. Offenders have to be placed appropriately as many are vulnerable themselves. There is a big contract with Devon Highways- cutting back pathways etc. They work with the National Trust, Dame Hannah Rogers Trust, Torbay Coast and Countryside Trust. It is good to work in the public eye as it shows that offenders are giving something back. It gives offenders positive activities. They are assessed for skills and are put on programmes to use skills and sometimes teach others. Several have gone on pursue the work as a career. They are also put on programmes to deal with issues such as anger, compulsions (can be shoplifting), anti social behaviour, Building Better Relationships programme for perpetrators of domestic abuse. The aim is to change this behaviour. Jess spoke about this. This meeting was organised by Healthwatch and put on by the Clinical Commissioning Group (represents all of the local GP practices and is the formal NHS body responsible for buying and developing services for local patients). Different doctors spoke about the 5 year plan for Torbay primary care services. Alan went along and was impressed with the last doctor- who spoke about minor injury units. Jess said that they talked about the patient being at the centre of the picture/ of the care. People should not go to their doctor unnecessarily. People need to be re-educated and often the pharmacist can help. There is a need to save money. Torquay and Brixham Connections offices are permanently closing on Friday 5 August. The nearest will be Paignton Library. If the enquiry cannot be dealt with online or by telephone an appointment will be offered. The telephone numbers stay the same. 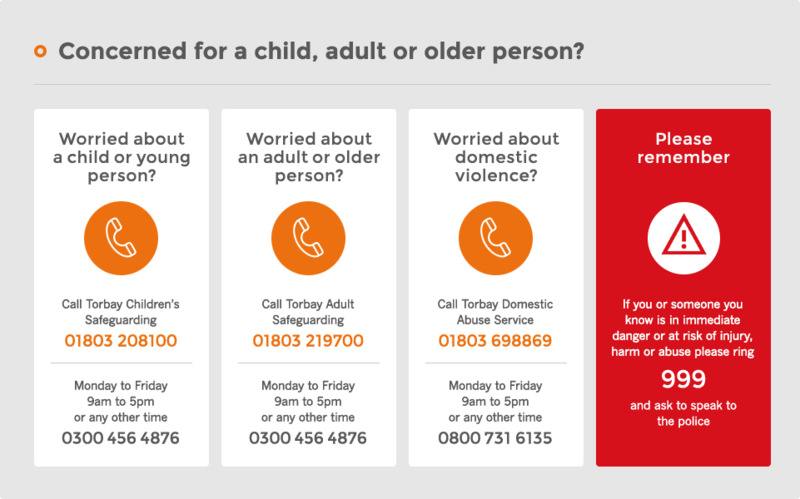 There will be a free phone in Torquay and Brixham libraries for Torbay Council enquiries and secure post boxes in these libraries to submit documents. Once a week drop ins are being considered but are in the early stages. There is a leaflet about the changes. This will be sent out with the minutes. Torbay Voice members are doing this- talking to residents in 6 care homes. The aim is improvement of service delivery in care homes. Torbay Voice members are asking questions about what people like and don’t like. Do they know who to talk to? They are looking at what people’s expectations of the home were when they became a resident. A lot of residents could not answer as they had dementia so Torbay Voice talked to people who were able to understand and interact. Jess said we need to be clear about the information we want to gather beforehand and cannot start collecting new things if these were not decided beforehand. This is an event to say goodbye and hello, and to look at the Torbay Voice workplan. This will be Jess’ last Torbay Voice event as she is leaving. Paul is staying on until end of August; possibly end of October- until someone takes over Jess’ post. Simon volunteered to chair the next meeting. If you would like to view the strategic work plan, please click here.